Depending upon traffic and weather conditions, holding may be required. Holding is a predetermined maneuver that keeps aircraft within a specified airspace while awaiting further clearance from ATC. 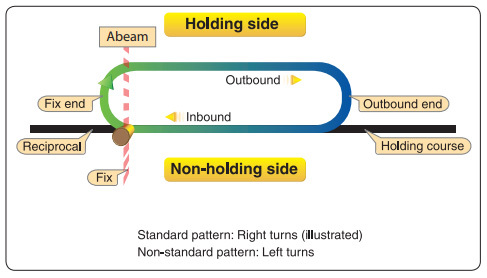 In a standard holding pattern with no winds, the aircraft follows the specified course inbound to the holding fix, turns 180° to the right, flies a parallel straight course outbound for 1 minute, turns 180° to the right, and flies the inbound course to the fix. If only one missed approach procedure is available, the reported ceiling and visibility minimums must be equal to or greater than the highest prescribed circling minimums for the IAP if a timed approach from a holding fix is to be conducted. When making a timed approach from a holding fix, the pilot should adjust the holding pattern to leave the final approach fix inbound at the assigned time. The first step in a hold is to fly to the fix. From this point you enter the holding procedure. The outbound leg is modified as needed (based on wind) so that the inbound leg is on the course line and the prescribed length (usually one minute). 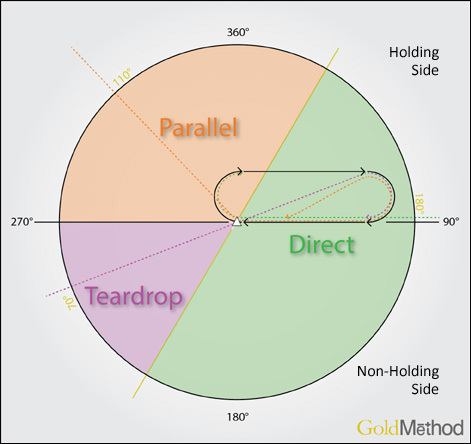 There are three standard entry types for holding procedures: direct, parallel, teardrop. You must report to ATC the time and altitude upon reaching a holding fix and when leaving the assigned holding fix or point.